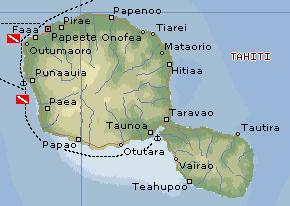 As you might expect, there are many dive sites off Tahiti and we dove at 3 of them. We might have done more, but we actually preferred the dives, the ambience, and the costs in Moorea, just 15 miles away. 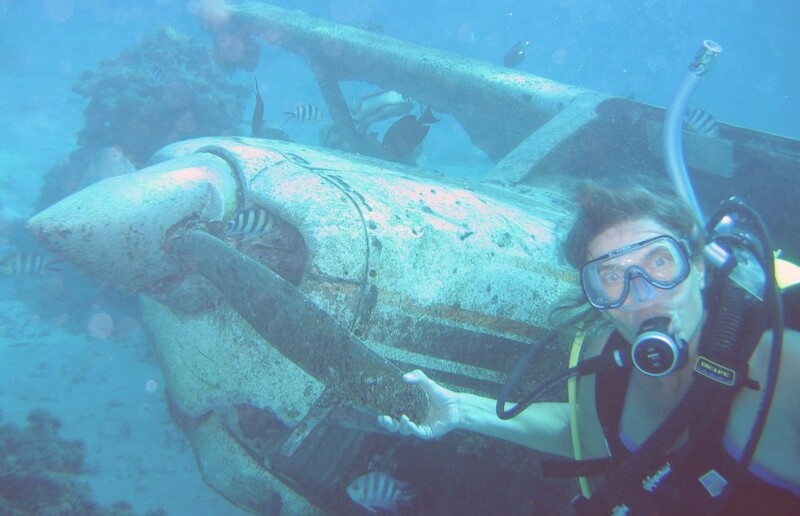 Our Tahiti dives were the Cessna Dive Bowl (The Aquarium), the La Goelette & Catalina wrecks, both in the NW corner near the airport, inside the barrier reef, and the St. Etienne Drop Off just south of the pass through the reef. Tank Rental: With Karen & Jon visiting for all of February, we researched places to rent tanks. By far the best deal was at Tahiti Plongee by the Maeva Beach Hotel. A one-month tank rental came to about $180 US, with a $400 deposit (returned in cash, even though it was paid on credit card). Daily tank-only rentals were $30, weekly about $80, two-weekly about $135. Other dive shops quoted monthly rates of over $400. Our visitors needed only tanks, as they had brought everything else, including weights. on the Marina Taina dock, Tahiti. Air fills: The going rate for fills was 1000 CFP (about US$11 - pretty expensive). There was a lot of discussion about whether French Polynesian dive shops would fill non-French certified tanks. We found that there was no problem at Tahiti Plongee or Eleuthera Dive with our US tanks which were brand new and had clear visual and hydro testing dates. One cruiser with older tanks that had missed an annual visual could not get them filled. Apparently once a tank has missed a visual, then the hydro must be done every two years instead of the normal 5 years. To get a tank hydro-tested in Tahiti apparently costs about $175. Since a new tank can be bought (in the US) for less, most French tanks are trashed after 5 years. Despite this apparent focus on safety, tanks are not filled in a water bath. Not only is this dangerous in case of a tank rupture, it allows the tanks to heat up as they are filled, so we often ended up with less than 3000 psi once they cooled. If we were willing to wait and pleaded for 3000 psi the shops would sometimes (but not always) fill them, let them cool, and then top them up. Fresh water: Rinsing scuba gear takes a lot of fresh water - more than we like to take from Ocelot's tanks. Having rented tanks for a month from Tahiti Plongee, we were welcome to use their fresh water to rinse our gear after a dive. We also used the free water on the Marina Taina dock several times. They prefer you to bring your (big) boat alongside the outer wall, tie off, and then use the water on board your boat, rather than put your dive gear all over their concrete dock. If you stay for only a few hours there is no charge, at least during off-season. Alternatively, you can collect fresh water in jerry jugs from either the marina or the public beach to the south and wash your gear on board. We found the public beach area itself too sandy/muddy for safe rinsing. Positions: We've now added latitude and longitude positions to our dive tables. We did not take a GPS with us - these positions were determined afterwards from our navigation charts. On this page, the position of the La Goelette & Catalina wrecks (and their companion wreck just to the north) are quite accurate, but the others should not be depended on too much. 50' (15m). 84°F (29°C) with no discernible thermocline. (Marina Taina). Several miles away. Yes, to the south of the wrecks there is shallower reef. and 2 small schooners at about 30 & 40 feet. (Jon) This is a large sandy basin inside the lagoon, near the east end of the airport runway. It's a little tricky to find by dinghy because you have to thread your way through a lot of shallow coral, but all the locals know about it and they'll point it out. There's a dive-boat mooring on the edge of the basin, which we tied the dinghy to. We used this dive as a sort of check-out dive, since we hadn't used our new gear before, and we hadn't been diving at all for 6 months. 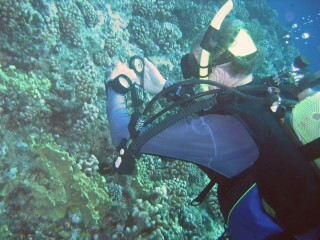 The dive was so shallow that we had plenty of time, even with 2 of us sharing a bottle of air. 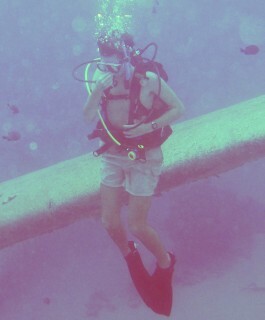 It was fun to swim around the wrecks, but the main purpose was for each of us to get used to the new gear, which we did. he drops over the Catalina wing. We started by figuring our weights. I didn't use a wetsuit in the warm water, just a T-shirt. I found I was neutral with 4kg, but I added 2kg more to compensate for the tanks getting lighter as they emptied. The Cessna was obviously a crash, as the prop was bent and it still had many of its avionics still in the dash! The 2 boats were pretty stripped but fun to explore. I suspect that all 3 were hauled to this site to make an interesting dive for tourists. For us, it also made a great place to test and get used to our new gear, including our new underwater housing for the digital camera. (Chris) One thing that I found interesting was that this was my first dive not actually on a reef. There was a little coral off to one side of the basin, but if the basin had ever held a reef that reef was long gone. 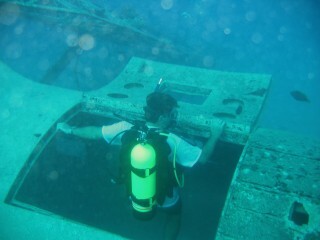 I certainly didn't mind diving on the wrecks, and there were still some fish (little ones) but it felt different. The wrecks themselves were very interesting, with the Cessna in particular seeming very nearly intact. We didn't try to actually get into the cockpit, (like the dive guide books showed) but it was easy enough to see inside. Some instruments had been removed, but other than that there seemed very little damage. (Sue) After the excitement of pass dives in the Tuamotus 6 months ago, this lagoon dive with no current or surge was delightful. It was shallow enough that Jon and Chris went down for about a half tank each, then swapped with Amanda and me. It was also a great place to practice with the new underwater camera because Jon could snorkel down to get shots of Amanda and me diving. On the slope above the wreck we explored some nice coral formations with many reef fish. It must be a cleaning station, though, as the blue-streaked cleaner wrasse were very aggressive and I was nibbled a few times while trying to photograph other fish. (Amanda) This dive was wonderful, compared to several other adrenaline-pumped ones we had before and after. 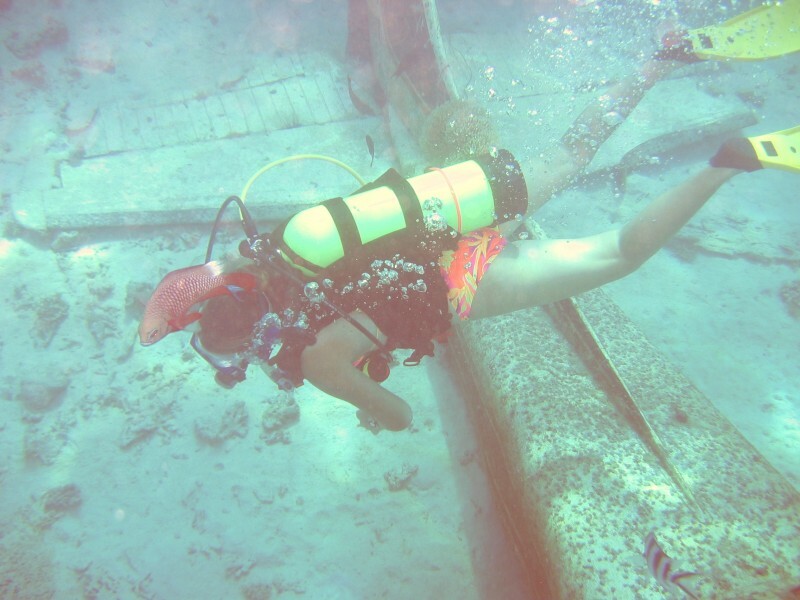 Mom and I had already snorkeled around the top, but there's no substitute to actually being down there with the wrecks. They were old, and the boats were slightly beaten up, but the Cessna was basically intact except for one wingtip. I was having difficulties with buoyancy (new equipment and all that...) but after we went up, then came down again, it was okay. 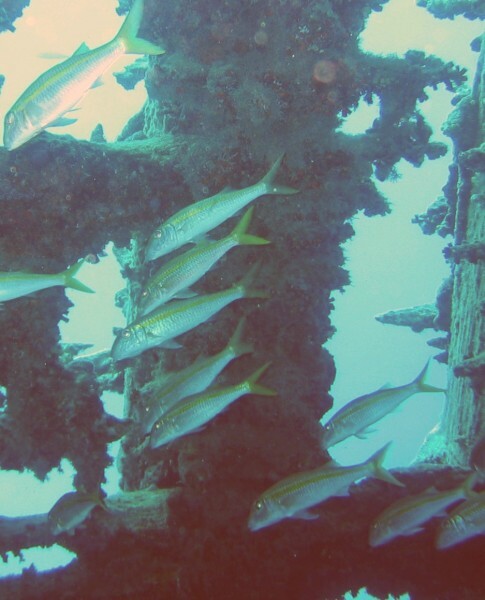 I even got comfortable enough to use the digital camera, snapping a few shots of fish and wrecks (and Mom!) alike. It was a fun first dive with our equipment. Yes, along the reef. Wrecks are barely visible from the surface. and a twin-engine Catalina flying boat. known to attack divers when protecting her nest. (Sue) We made two dives here, a couple weeks apart. First with Karen and Jon, and then with Vince in mid-February. Amanda and I snorkeled over the divers the first time and saw our first Titan Triggerfish. 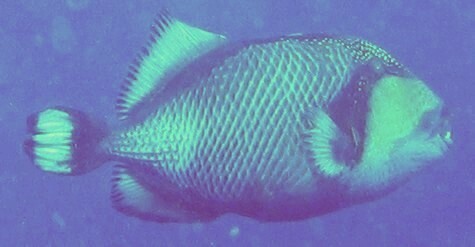 This is the largest triggerfish, and pretty impressive underwater. When I dove here with Vince and (Ocelot) Jon we all got overly acquainted with a 2.5 foot female Titan Triggerfish who attacked each of us, in turn. We later learned that the females are known to attack divers who venture too close to the nest. This fish drove us off by swimming aggressively towards us, and was repelled only momentarily by a fin in the face, or a fist punched in her direction. Not knowing why we were being attacked, we swam one length of the Goelette wreck, and then back again. First she went for me, then Vince, and finally Jon. It was a few minutes of heavy breathing, that's for sure. A French diver later told us that the danger is not that she will bite (though those teeth sure look unfriendly) but that she rams her opponent in the belly. Other than the fish encounters, this was a great dive site! under a ledge about 25 feet down. (Chris) This dive was definitely among my favorites. First of all, the combination of good reef and really interesting wrecks was wonderful. Second, this was one of the best places that I can think of to see fish. In particular, seeing my first lionfish was really memorable. I should admit that I didn't actually spot him first, (Karen and Jon did) but I had the camera so I got the photographs. Since then, I have been looking under every likely ledge, hoping to find another one resting there. It isn't like they are hard to catch (bigger concern is keeping your distance) but they seem to hide often. Lastly, everything was pretty close together, so while there was a lot to see, it didn't take much strenuous swimming. No chance of getting bored though, and I spent a long time exploring. 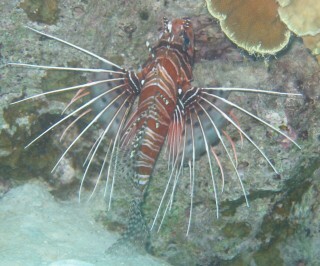 The reefs were nice, but aside from the lionfish the really special thing was the wrecks. The Catalina wasn't in quite as good condition as the Cessna but it wasn't bad. The cockpit was more stripped out and there were a few holes in the fuselage, but the structure was mostly intact. It was a lot of fun looking inside, a lot of fish seemed to like it there. However, the large cargo vessel (La Goelette) was really impressive. most of its wood had rotted away, but the metal was still clearly visible. Interestingly, the pipes and various other parts of the hull seemed strewn about as if there had been an explosion. For all I know, there might have been, though I'm no expert. Anyhow, we were able to see inside to the engine room and a few other parts of the hull. The cargo bay was just a big open area, easily visible, teeming with fish. Overall, this was a truly wonderful dive. (Jon) We used this as a check-out dive for Vince, since he'd just arrived and hadn't dived for some time. 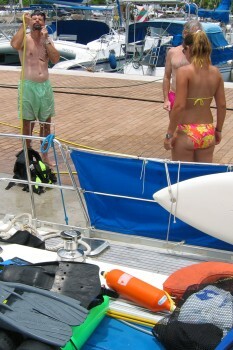 Since the wind was very light and it's pretty far for the dinghy, we took Ocelot over and tied to one of the moorings. The trip involves going past one end of the airport, which means calling them on the radio to make sure we wouldn't snag a passing 747 on our mast each time. This is a fun dive because of the 2 wrecks to explore. The Catalina was obviously scuttled as the avionics and engines have been removed. It is not the wartime version with the gun blisters in the waist. It was probably scuttled recently as there is little growth on the hull. You can go into the open cargo hatch, through the fuselage, sit in the pilot's seat, and then exit via the open hatch above the pilot's seat, but I was feeling like I had too much ganglia hanging off me. I felt very in control going forward, but I would have had a lot of trouble backing up, so I went inside, but not up forward. The Goelette is much older and a bit deeper. Originally a wooden ship, most of the outer cladding is gone, leaving only the ribs and some interesting fastenings for the hull. Inside, much of the 5-cylinder engine, steering gear, and tankage can be seen, as well as lots of debris scattered over the bottom, including the smoke-stack. Note that the nautical charts show another wreck in this little bay at 17° 32.6'S, 149° 36.5'W, or just 0.1 miles further north. It appears to be in about 80' (25m) of water but we did not verify or explore this wreck. A steep wall parallel to the reef. Good coral and many small fish. Checking the depth is critical on a wall dive. (Sue) Getting to this site requires taking the dinghy out the pass south of Marina Taina, then south along the reef until you're opposite the St. Etienne church. The mooring balls mark the spot exactly. This should be done only in settled weather. After splashing into about 15 or 20 feet of water, you swim to the edge of a great abyss. I always find this a bit unnerving, and exhilarating -- looking down into a nothingness of blue. We swam down to about 60 feet (20m) and headed north against a very light current until we had about 1200 psi left, then turned and came back at a shallower depth. A coral garden lined the walls teaming with small reef fish. (Amanda) I must say, this dive was not one to inspire confidence in me. I was a bit iffy about doing a dive outside the reef of Tahiti, but spur-of-the-moment I said what the heck and went along with it. There was no wind out there, and only a gentle swell, so the dinghy ride wasn't too crazy as we rode outside the reef to the buoys opposite the St. Etienne church. The beginning was fun. The reef sloped down gently, so it wasn't like we were really on a drop-off (one reason I hadn't wanted to go - I can't stand the thought of diving straight over nothing but blue...). We saw an eel or two, and a few beautiful fire dartfish. 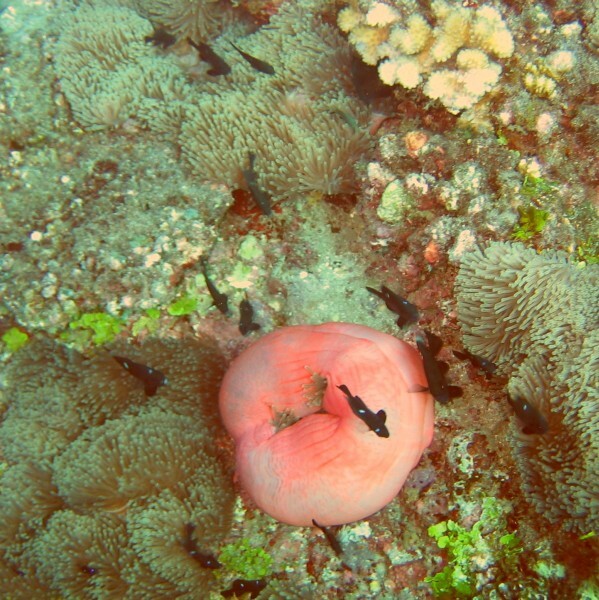 Small anemone fish meandered around their respective anemones, and all was going wonderfully. But then I realized that my BCD wasn't releasing air. No matter how much I pushed the button (I promptly forgot about the other two methods of getting the air out) one side stayed inflated. As long as we stayed around 55 or 60 feet, it was fine, but the safety stop at 15 feet was torture. If the mooring line hadn't been there, it would have been really hard to stay down.